Sony’s once massive Walkman brand is still going, however the glory days are long gone. 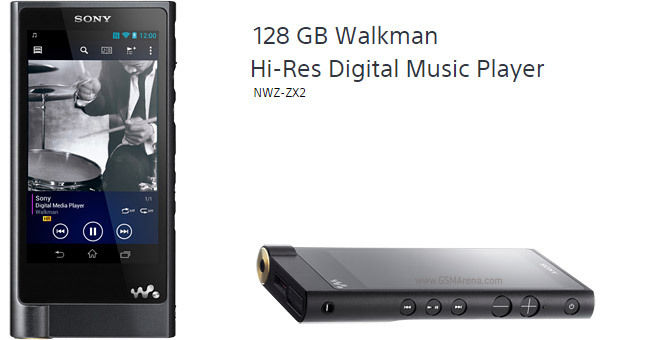 I’m not sure how much market there is for music players in general, Walkman or otherwise, but I can guess the market size for a $1,200. It’s as high-quality as a pocketable player gets – it supports FLAC/ALAC (up to 96kHz/24-bit) and Bluetooth with SBC/LDAC hi-fidelity codec. Dual-band Wi-Fi is also available for DLNA playback. The player packs a massive 128GB – or not so massive considering a single FLAC album is in the hundreds of megabytes, a full gigabyte even. There’s a microSD card slot if you run out, but at an ultrabook price we were hoping for a bit more room out of the box. Anyway, the Sony Walkman – officially NW-ZX2 – runs Android on a 4″ screen. The screen is not up to up to par with the audio capabilities. Not that the screen is a crucial part of a music player, but something better than 480 x 854px would have been appreciated. Android 4.2 Jelly Bean is also not our top pick. With the whole “will they, won’t they” upgrade situation on phones, I don’t even want to think what it’s like to wait for a music player to be updated. Did I mention that for $1,200 you don’t get an impressive pair of headphones? Or any headphones? Headphones are essential, otherwise the difference between FLAC and MP3 is imaginary. Just saying that you have to add several hundred dollars more if you want this Walkman player. At least it gets decent battery life – 60 hours. If you listen to 128Kbps MP3s. If you want to use the player as intended and listen to FLAC, you get about half the battery life, 33 hours. If you want a smaller device at a quarter of the price than this seems like an option – $300 for 64GB and an empty microSD card slot. Or if you insist on Android, you can get the Harman/Kardon HTC One (M8) that also supports 96kHz/24-bit FLAC audio. There’s a phone with a good screen and such in there too, besides the audio playback.